In a post from 2009 over at Between the Times, Bruce Ashford quotes Augustine on Psalm 26, encouraging the Christian to see the God of creation behind the wonders of creation. The pleasure we experience in seeing a beautiful cathedral reminds us to admire the church’s architect. How much more should viewing the universe’s infinite variety stir us to praise the Beauty of its Creator. Consider, for a moment, the whole of creation. The splendor of the starry skies, the various flowers in a flower garden, the stately majesty of a cluster of trees, the melodious songs of birds, the variations of creatures in the animal kingdom, the sense and intellectual faculties of a human person, are like so many voices that praise the Beauty of their Author. Words fail us in our effort to describe adequately what the beauty of the universe tells us of the Divine Artist’s Beauty. Does triumphant music come closer to expressing God’s Beauty? First, this passage from Augustine reminds me that the God we worship is not just truthful (indeed, is not just ‘the truth‘), and not just good, but also beautiful. Secondly, the three transcendentals of goodness, truth and beauty also provide a handy tool for analysing arguments. The tool works well for arguments for and against Christianity, as well as for arguments in our academic disciplines. Hardly any arguments trade only on truth. Even if a given argument presents itself as concerning only the truthfulness of a certain state of affairs, it almost certainly rests on the assumption that it is good for this truth rather than other truths to be considered, or that this truth deserves our attention because it has a pleasing beauty to it. 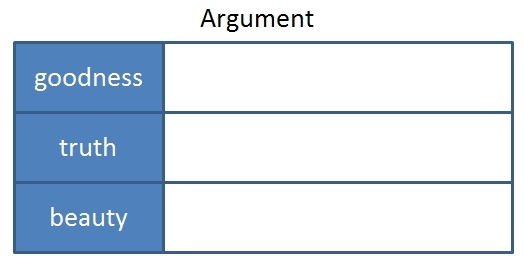 Quite often, arguments will lay little stress on truth at all. Arguments of this sort often claim that truth about the matter in question simply cannot be known, and they appeal instead to a set of values with which the argument resonates, or to its intrinsic elegance. What assumptions, if any, is this argument making about what is to be considered ‘good’? What values is it necessary to hold in order to think that, if this argument gained universal assent, the world would be a better place? What is this argument claiming to be the case? What is it necessary for it to assume to be the case in order to make its claims? What, if anything, makes this argument aesthetically or intellectually pleasing? This might include its economy, its elegance, its alliterative schema, or the way it seems to account for previous theories better than they can account for themselves. One way or another, it has a certain shapeliness to it. Once you have something for each of the categories, set them out in a simple table, either on paper or in your head, and decide on a proportional importance to give each of the three transcendentals for the argument you are analysing. Is goodness it’s most powerful claim? Does it rest primarily on what is the case? How much of its appeal is down to the fact that it is just irresistibly well presented? Why bother with all this? Because it’s only when we know what sort of argument we are dealing with that we know how to respond to it, either in our disciplines or in the defence of Christianity. If an argument rests primarily on an appeal to the good (things must be this way, because if not odious and evil consequences will ensue) then responding to such an argument with claims that its assertions or assumptions are false will never get to its heart. Even if you convince people of your point of view, you will have only reluctant converts. One of the great strengths of Tim Keller’s pattern of cultural engagement drawn from 1 Corinthians 1 is that it seeks to discern the ‘good’ (or at least one good) at the heart of a particular culture (or academic discipline, for that matter), and shows how that good can only fully be possessed in the truth of Christ. In forming and presenting our own arguments, whether in our disciplines or in our defence of the faith, would do well to consider each of these categories.